Seems like all new things that come to Leduc in its early years started in downtown. By the time Paul Therriault sold his livery stable in 1923 the automobile had replaced horses as the normal means of transportation. By 1924 both the Leduc Hardware and the Moss/Bullock Hardware stores had established Bowser pumps in front of their stores to meet the needs of their customers. It didn’t take long for individuals to see the need for auto mechanics and by the mid 1930’s several auto mechanical shops were open for business on 50th Avenue. Perhaps the best know was called Otto’s Auto Service and was operated by Otto Grubert. One of the first gasoline companies to make their products available to Leduc residents was the Purity 99 Oil Company. This was an Alberta company that built their own refinery in Turner Valley. The company expanded and by the 1940’s had stations across the prairies. In 1953 the company was bought out by another Canadian company called the Anglo American Exploration. Purity 99 would keep its brand name. Eventually BA bought out Anglo in 1963 and in turn was absorbed by Gulf Canada in 1970 and the Purity 99 brand name disappeared. Gulf would be sold to Petro Canada in 1985 and now is part of Suncor Energy. The Leduc Motors, located on Therriault’s original Livery stable site, sold Purity 99 gas for 11 cents a gallon in the early 1950’s. Other well-known Alberta brands available in Leduc during the 1930’s and 40’s were Red Head and Royalite as well as the still familiar international companies of ESSO and Shell. It didn’t take long for several Leduc businessmen to decide there was money to be made in selling automobiles directly to Leduc residents and a number of dealerships opened their doors to the public. Among the first to open was the Maple Leaf Motors in 1937 and would sell Dodge and DeSoto cars and trucks. Their competition saw Ford’s being sold by H. Judson’s Garage and in 1947 Howard Henderson open up his Chrysler – Plymouth – Fargo dealership on the corner of 50th Avenue and 48th Street. Henderson had trouble opening up on time as three weeks prior to the grand opening a huge wind and hailstorm hit the area and blew out 15 of the buildings windows. The storm was so large that dirt blown into the air as far away as Telfordville could be seen as a black cloud. 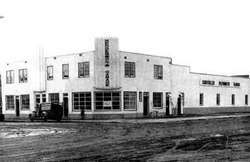 The dealership was, at the time, the biggest in Leduc and provided gas and a repair shop as well as new and used trucks and cars. In time Henderson changed the cars he sold to Buicks and Pontiacs. Just as the various grocery stores found it more and more difficult to serve their customers because of increase traffic flow and moved to locations that could handle the parking needs of their customers the various dealerships began to move away from downtown to more convenient locations. By 1961 Henderson had moved and sold the building. Today a number of businesses are located in the structure where one once bought and had repaired their automobiles. The building has been modernized and streamlined and from the front looks nothing like what one saw when Henderson sold his cars, but if you walk around the back you can still see the white wall just as it looked in the 1950’s.